And now here is my flash fiction. Enjoy! Jake tapped his wand against the edge of his plate. The peas that remained obediently lined up around the outer rim of his plate, while the baby carrots stood on end and began marching around the inner ring. It was a mini carrot parade with pea spectators. “That’s baby’s play.” Rosie scoffed, pushing her own vegetables around her plate with her fork. “Is not!” Jake whined. His lack of concentration caused the cooked vegetables to fall abruptly. “Is so! You’re just a silly baby.” Rosie pushed away her plate and folded her arms across her chest. Eyed her brother closely to see if he would succumb to tears. “Oh yeah? Well – you’re a silly baby.” He stabbed at his once animated carrot with his fork and shoved it unceremoniously into his mouth. She knew she shouldn’t tease him. Their older sister Rita called her the same names when she was just beginning to learn magic. After all Jake was only eight years old, nowhere near as grown up as her twelve years. She looked around first, making sure their mother was still busy in the other room, before she tapped her teacup once. She whispered the incantation under her breath so Jake couldn’t hear. 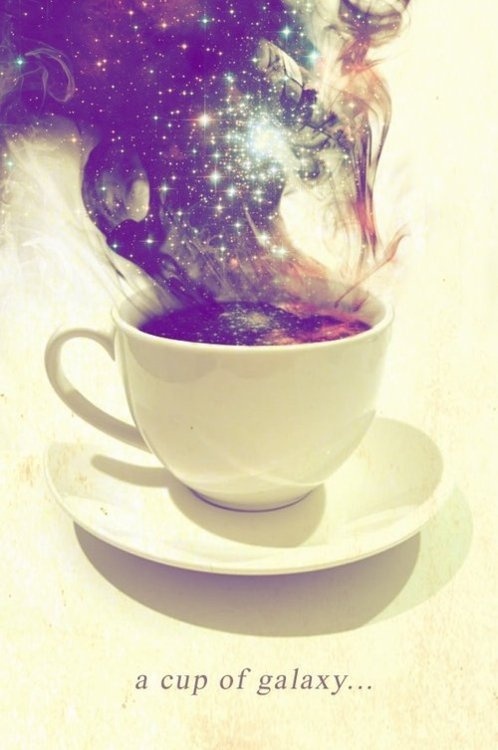 The once milking white steam that rose from the teacup turned grey then inky black and sprouted tiny twinkling stars. Jake’s eyes grew as big as the full moon and his mouth gaped revealing a mixture of orange and green sludge. He dipped his fingers into the steam galaxy, swirling the stars in concentric patterns. She leaned back in her seat; a huge smile spreading across her lips. It’s brilliant, and flows perfectly; The whole dialogue between siblings and whole description of the cup of galaxy. I love this!!! You are always so creative…. I tend to repeat. Think I need to get back into romance and mystery. LOL! Love the picture, the whole romantic idea of galaxies in odd places! Love the sibling rivalry too, great writing! Thanks Lisa! When I saw the pic I just KNEW I had to use it. A lovely, magical, slice o’life! I like the conversation you’ve included :)) and all of the magical details like the carrots marching around the plate. I saw this picture on your likely choices and knew it would be the one for you! Well done, Ms Creative! Great! So visual and wonderful to see magic in its proper place in the world – everywhere! Pingback: Listing the Listless List - "Snow, Glass, Apple"
I want a cup of galaxy! You’ve captured the sibling relationship perfectly here – with a fabulous dash of magic! The elder one wins!!! had fun reading it.. the innocent little sibling_fights_talks, wonderful..